The new option allows any product from either the Z or E lines to be converted to PoE. Vancouver, Canada - July 24, 2012 - fSONA Networks today announced a new power option for their award-winning SONAbeam free space optical wireless links. 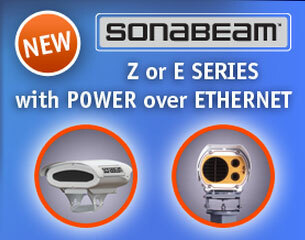 The SONAbeam Z and E series can now be ordered with or upgraded to Power over Ethernet (PoE). A SONAbeam Z or E system adapted with the PoE kit can be connected to any standard network port using the PoE kit, via the included injector. SONAbeam with PoE saves time and money during installation by eliminating the need for separate cabling and, in some instances, separate contractors to run both power and Ethernet. There will be three versions of the SONAbeam PoE kit - one each for North American, European and Universal power cord types. "Power over Ethernet simplifies installation by running both power and connectivity over the same type of cable," commented fSONA President and CEO, Andrew Grieve. "This reduces time to deployment and increases ROI for our customers who want to avoid delays and get connected quickly." The SONAbeam E series connects locations up to 1000 meters apart and up to 2.5 Gbps (OC48/STM16). The SONAbeam Z series is optimized for links up to 500 meters and also operates at speeds up to 2.5 Gbps (OC48/STM16). SONAbeam eliminates the substantial costs of digging up streets and sidewalks required to install fiber, and unlike other wireless solutions, the SONAbeam is immune to electro-magnetic (EM) and radio-frequency (RF) interference which means no licensing is required. fSONA Networks manufactures the highest-quality, highest-performance, free space optical wireless communications equipment on the market today. Key to SONAbeam's breakthrough laser technology is its operational wavelength of 1550 nm, which provides a broad spectrum of safety and performance advantages. The SONAbeam's high-powered laser transmitters are able to penetrate heavy rain, snow and fog far more effectively and consistently than any other available FSO technology.